﻿ Dozens injured after a train derailed in Taguig City. 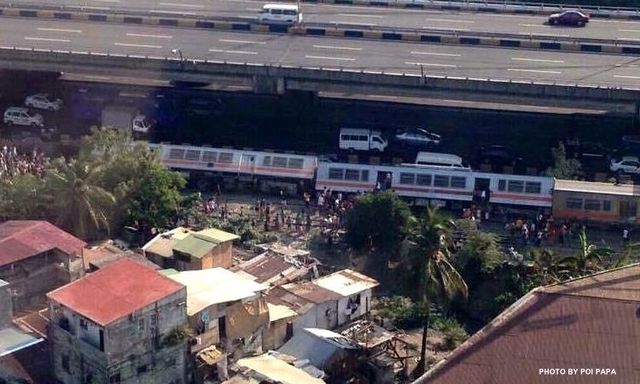 Dozens injured after a train derailed in Taguig City. About 80 people were injured after two coaches of a Philippine National Railways (PNR) train derailed and fell onto their sides in Taguig City. Inspector Jonathan Aribe, Taguig Police Community Precinct 7 commander, said the derailment took place at 3.46pm. According to Aribe, the PNR train carrying about 500 passengers was headed south from Manila when, upon reaching the bridge that served as the boundary between the cities of Makati and Taguig, its first coach went off the track, causing it to fall on its side. Aribe said the first coach pulled the next one down, causing it to also topple over. “So only the third or the last wagon of the train remained standing,” he added, noting that as soon as the two coaches fell over, the entire train stopped moving. Aribe said around 80 riders were injured after they hit their heads against hard surfaces. Some were rushed to the Taguig-Pateros District Hospital for treatment. Others, however, opted not to go to the hospital. “All the around 80 passengers sustained minor injuries. Some suffered bruises, others suffered trauma because of the incident,” Aribe said, noting that he talked to one passenger who hit his head after he jumped off the train while it was still moving. Aribe added that it was still unclear what caused the two coaches to go offtrack, saying this would have to be determined by the PNR. “Our concern now is to guard some of the things that some passengers left behind in the train,” Aribe said, noting that as of 5:46 p.m., the two coaches were still down. One of those injured was 2-year-old Jillian who was with her mother, Jewel. Jewel said they were seated in the first coach when she heard a loud metallic sound. The next thing she knew, many of the passengers who were standing up were falling on her and her daughter. “We ended up being pinned down as the wagon fell on its side. And my worry is that my daughter may have sustained some injury in the process. That’s why I am having her X-rayed,” Jewel told the Inquirer. She said she had heard reports that the PNR would shoulder just the hospital expenses of those who had train tickets. ALSO READ: Can historic map prove Scarborough Shoal belongs to the Philippines? “But we lost our ticket in the train. What’s going to happen then?” she said as she decried the fact that no PNR personnel had talked to her at press time.